The days of viewing massage as a “luxury” are long gone. People who know how to take care of themselves understand that massage therapy plays an integral role in maintaining an optimal state of health. Best of all, it just feels good! To understand why massage is so important to your bodies health, you need to know what creates imbalance in muscle tissue. Any type of repetitive movement or even stress can create muscle inflammation. Splinting occurs when these muscles become exhausted and overstretched. Receptors believe the muscle is in danger of tearing and they signal the fibers to shorten. Once the muscle splints it remains shortened and any use of that muscle will now create more inflammation. The next protective maneuver is to create adhesions, or bridges of tissue from the muscle to the closest stable area. This does in fact make the muscle stronger but in doing so it renders the muscle useless as it is unable to stretch and contract. This can cause what is known as muscle atrophy. Surrounding muscles then have to take over the inactive muscles job which creates imbalances in the left and right sides of the body. This is a vicious, repetitive cycle that can advance to the point of skeletal bones being pulled out of alignment which can place pressure on the spinal cord. Forcing bones back into place without addressing the muscle imbalance is the wrong course of action! If you treat the muscle imbalance, restore proper energy and blood flow, the bones will generally return to proper alignment on their own. The lumps, bumps and knots are going to disappear with our deep tissue massage. The problem areas of the neck, back, chest and glutes will be our main areas of focus. Most forms of misalignment originate from these areas as tight muscles can pull skeletal bones out of place causing neurological impairment. Our intention is to release these splinted muscles so that painful trigger points can be relieved and proper alignment can be restored. This is clinical massage therapy. There may be times of discomfort as trigger points are released. It is important to communicate with your therapist so you can work together to achieve a comfort level that you are happy with while achieving the best possible results. Thai Massage is a unique form of massage that dates back thousands of years. It is believed that it originated from the personal physician of The Buddha. 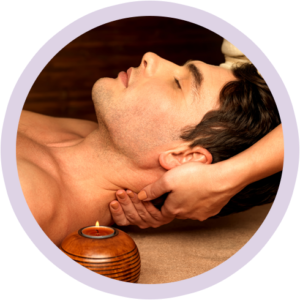 Thai Massage focuses on moving energy through the sen sip pathways of the body relieving stagnation and pain. You will be receiving this massage on a Thai Yoga mat which is somewhat like a large pillow. You will be taken through a variety of postures that resemble yoga poses that will stretch and elongate tired muscles. A deep sense of relaxation is achieved as blockages are released and proper energy flow is restored. Wear something comfortable that allows you to move freely. We love athletes! And we want to see you performing at the top of your game. Taking care of an athlete and their unique physiology is a challenge. Toxins build in your system as lactic acid production increases. Muscles can have a difficult time repairing from grueling workouts if they are not provided with the proper nutrients that they need to regenerate and energy flow can become blocked from repeated injury. Your body can only take so much before it needs help in maintaining balance. That is why it is important to address all of your internal processes. We will address muscle imbalance, energy flow, energy production, Cranio Sacral integrity and nutrition in an attempt to elevate you to a higher level of proficiency. If you are an athlete you take your sport seriously, let us help you be the MVP. The cervical area is a difficult region to keep healthy as all of the tissues of the body converge into a very small space to distribute nerve impulses, blood and interstitial fluid to the brain. The head also releases fluids that have to travel down through the neck to distribute their toxins out of the body. If you have excessively tight neck muscles this process will not happen as efficiently as it should which can lead to pain, headaches and frequent sinus infections. This therapy releases tight muscles and opens up lymphatic pathways to allow for proper fluid distribution. If time permits the back is also addressed to encourage neurological functioning along the spinal cord. Every system in the body will function better when painful trigger points and neurological blockages are removed from this delicate area. This is one of the most important things that you can do for yourself as a new mom. Creating a new life is extremely taxing on a woman’s body. It is essential to take care of yourself every step of the way along this beautiful journey that you are on. As the months go by more and more of mom’s energy goes to nourishing the baby and less is left to manage simple things like fluid distribution and muscle tonicity in her own body. Prenatal massage gives you the extra help that you need in executing these processes. You will find yourself sleeping better and experiencing less swelling as the energy is able to move through you more efficiently, which means baby is healthier and happier as well. Stacey is the only person in the office that performs prenatal massage. She is not only trained in prenatal massage, she is also trained in Chinese Medicine which entails thorough training in pregnancy. So you can rest assured that you and your baby are well cared for. This is a very popular treatment in our office. As you get close to your due date this treatment will focus on areas of the body that encourage energy movement. As a pregnant woman your body has been in a state of perpetual “stagnation”. Some women’s bodies have a hard time transitioning from this state of stagnation to a state of movement which can delay labor. As we are seeing more and more moms that want a natural birthing experience this state of stagnation can interfere with that. This unique combination of massage and acupuncture will signal the body to awaken out of hibernation and get things moving. This is generally a course of three to four treatments depending on how close you are to delivery. Mom’s have reported sleeping better, being in less pain and quicker deliveries after receiving this treatment. Reiki is a spiritual, vibrational healing practice used to promote balance throughout the human system. Reiki does not involve physical manipulation or the ingestion or application of any substances, but works with the subtle vibrational field thought to surround and penetrate the body. (Reiki is commonly translated from the Japanese as universal life energy.) 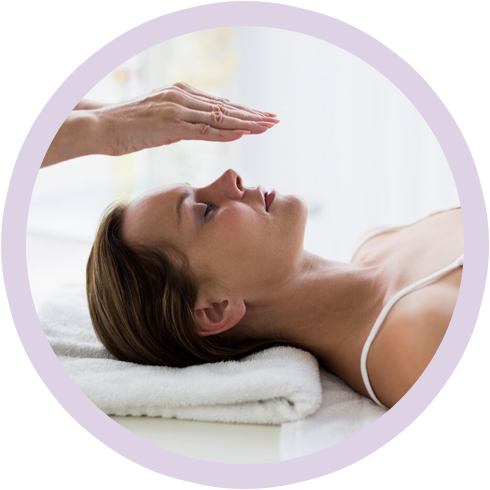 Who can benefit from a Reiki Treatment? Anyone experiencing pain whether physical or emotional. Reiki can balance the energy fields in your body known as Chakras which can put the body into a position of healing itself. Reiki is a great non-medicinal way to reduce stress. And we all know that stress is the precursor that leads to many physical ailments. 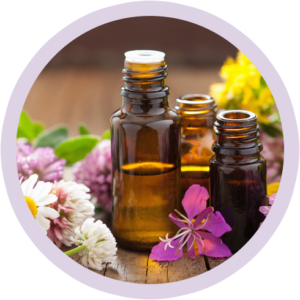 Many people these days have heard of Essential Oils on some level – even if it is just something that smells good. However, if you haven’t figured out that there is MUCH more to them besides their relaxing or mood altering aroma, then you are truly missing out! As humans we have an intimate relationship with plants. They are universally accepted as a means of keeping us in good health when we consume them. Essential Oils are basically the very essence of those plants or the lifeblood, if you will. The use of these oils affects our bodies at a cellular level and works to restore balance both physically and emotionally. The Raindrop Technique is a process of anointing the spine with specific oils in a particular order that can greatly aid in the process of detoxification. This is a vital addition to our detoxification program that everyone can benefit from. So set aside an hour and enjoy the benefits of nature at it’s very core.